Outsource jobs: new way to cut pension costs? 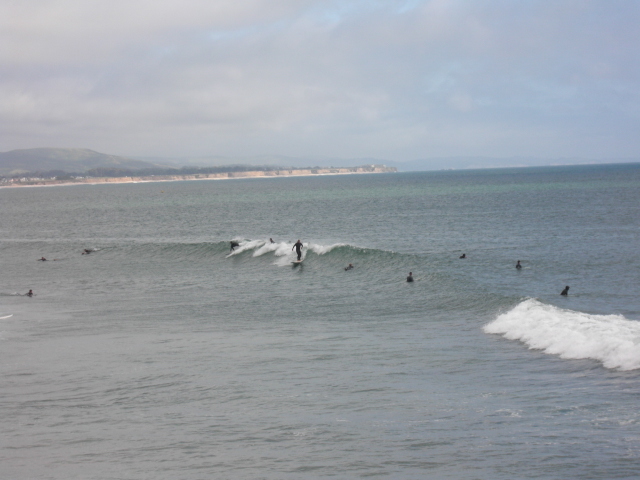 HALF MOON BAY — This small city on the San Francisco peninsula finished contracting out half of its jobs last week, quietly achieving a goal proposed by Orange County’s Costa Mesa in March that drew national attention and became a partisan issue. 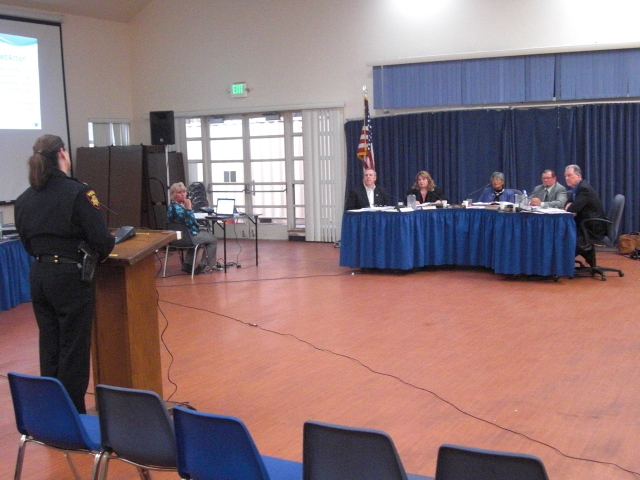 The Half Moon Bay city council unanimously voted for cost-cutting contracts that replace the police department with the San Mateo County Sheriff’s office and the recreation department with similar services from the city of San Carlos. The scenic city of about 12,000 residents, located near the famous Maverick’s big-wave surfing site, previously had contracted out public works, engineering, attorneys and building inspection and code enforcement. The $10 million general fund budget for the new fiscal year has the full-time equivalent of 14.6 jobs, down from 31.8 in the current year and a 75 percent reduction from five years ago. Laura Snideman, the city manager, told the council that Half Moon Bay is now a “contract city,” outsourcing more than half the personnel and half the budget. All police department employees are expected to transfer to the sheriff‘s office, some at lower pay. The interim police chief, Lee Violett, said that after first-year transition costs the five-year contract with the sheriff’s office is expected to save the city about $500,000 in the second year. “I believe that savings will grow over the ensuing years of the contract, primarily due to the decrease in the PERS liability (California Public Employees Retirement System) and other liabilities that face the city,” Violett said. The city’s financial problems began with an $18 million settlement in 2007 over a blocked 83-house development. A judge ruled the city created what became protected coastal wetlands by botching a storm drain and allowing dirt removal for nearby housing. Councilwoman Marina Fraser told her colleagues last week that the city had come a long way since a “somber” meeting two days after voters rejected a sales-tax increase last November. “We are in the first group of many cities going down this road, contracting for services for our community,” said Fraser. In Costa Mesa, six-month layoff notices sent to 213 of the 472 full-time city workers in March were greeted by Republican activists and Democratic-leaning public employee unions as an echo of anti-union movements in Wisconsin and Indiana. “The move will, in one great sweep, reinvent municipal government here, and perhaps lead the way for other cities,” a New York Times story said a week later. Added emotional impact came when a 29-year-old employee who got a pink slip, after four years as a maintenance worker, went to the top of the five-story city hall and jumped to his death. The outsource plan was pushed by a newly elected councilman, Jim Righeimer, the author of an unsuccessful initiative, Proposition 226 in 1998, requiring public employee unions to get individual consent before using dues for political purposes. After failing twice, Righeimer was elected to the council despite well-funded union opposition. He based much of his campaign on controlling pension costs, which are $15 million of a $93 million budget and expected to be $25 million in five years. Costa Mesa has about 110,000 residents and is known for an upscale mall, South Coast Plaza, said to have annual revenue of more than $1.5 billion, the most of any mall in the nation. A union coalition has run television, internet and print ads attacking the city council, where heated clashes have erupted during meetings. Righeimer has predicted that the unions, who are trying to block layoffs in court, will launch a recall campaign. Public pension costs, now a hot topic, are giving new momentum to an old issue for Republicans: replacing government employees with private firms, pushed in the past for prisons, school busing and other services. The practical argument is that contracting for services can cut government costs, often because of less generous retirement benefits in the private sector. A theoretical argument (for example, charter schools) is that competition improves performance. But the debate is colored by politics. Public employee unions are a pillar of the modern Democratic party, particularly for campaign contributions, and Republican proposals to switch to private contractors can look like partisan warfare. In local government, contracting for some of the biggest expenses, police and firefighters, is usually with another government agency, particularly on the San Francisco peninsula where some advocate “regionalization” of services. A larger agency might reduce administration and equipment costs. Having a single regional employer also might reduce union leverage during labor contract negotiations, where benefits are raised to be competitive with neighboring government agencies. An example of how contracting is evolving is San Carlos, which outsourced its police services to the San Mateo County Sheriff’s office last October before obtaining the contract last week to provide recreation services at Half Moon Bay. After a disagreement over cost-sharing, San Carlos decided last fall to dissolve its joint fire department with Belmont. The San Carlos city council voted 5-to-0 in April to form a new joint fire department with Redwood City. One of the proposals, opposed by 20 speakers and a raucous audience, was fire service from a private firm, Wackenhut, a provider of fire protection for NASA at Mountain View and the Jet Propulsion Lab in Pasadena. The Wackenhut options had the lowest cost, drew praise from a council member for innovations and were called “by far the best overall proposal” by a council consultant, TriData, that evaluated the proposals. “Three notable cost impact differences between WSI (Wackenhut) and municipal models are their approach to providing retirement through 401(k) versus PERS, provision for up to a 6 percent annual bonus based on consistent high performance and use of new technology,” said the TriData report. But on the “downside,” said the consultant, Wackenhut has no current city clients, little experience in building public trust, and the privatization of fire services could raise legal issues and impede regional partnerships. The council voted 3-to-2 to ask Wackenhut to resubmit its proposals if labor negotiations block an agreement with Redwood City. “That’s your feet to the fire,” Councilman Andy Klein said to the firefighter unions. This entry was posted on June 13, 2011 at 7:22 am and is filed under Local, Reforms. You can follow any responses to this entry through the RSS 2.0 feed. You can skip to the end and leave a response. Pinging is currently not allowed. Due to “practical” issues such as (a) the difficulty in significantly reducing pensions and benefits for CURRENT employees for future service, and (b) the “substitution” concept whereby if you take something away you must give back something of equal value. The above effectively handcuffs cities with insufficient money to continue the status quo. Couple that with the MUCH MUCH greater “total compensation” (pay + pensions + benefits) in the Public VS Private sector for comparable jobs, and we’re stuck between the proverbial “rock and a hard place”. OUTSOURCING is the BEST practical solution, as it ENDS the “employment relationship” and with it any future growth in pensions. It’s the same as a “hard freeze” on Pensions … a VERY desirable outcome given the current (and long-term) financial mess we’re in. In the future it will be great no one will have a job and the goal of the GOP 100% unemployment will be achieved. Hurray – misery, squalor and starvation for everyone! Historians will look back baffled at how people voted against their own self interest literally cannibalizing on their peers so that some billionaire can add another zero to his dormant, economically inactive bank account. No, it’s not the Billionaires against the middle class, it’s Civil Servant Greed riding on the backs of MIDDLE CLASS private Sector taxpayers. Perhaps when (not if) we succeed in reducing YOUR pensions &benefits to a level no greater than OURS (the people who pay tour way), …. THEN perhaps we can join forces and improve the situation for ALL of us TOGETHER, NOT just for Civil Servants at the expense of everyone else. Definitely reduce public pension and benefits… I think the problem was more innumeracy than greed, although the greed that trickled down from the $1,000,000/year executive post-employment deals in the private S&P 500 companies did influence the public sector. There is every bit as much destructive greed at the top of the private sector as in all the public sector combined. Let’s add a condition to any company (very broadly defined) that takes a penny in public money: no pension for any executive that exceeds 2X the median salary in the US. If it is good for the public sector, do it also in any private sector company that gets money from the taxpayer. Also: any political donation or lobbying originating from publicly traded company must be unanimously approved by the stockholders. Same for union political donations… must be unanimously approved by the membership. Soooo, Democrat efforts to block any and all privatization efforts is NOT “partisan warfare”? Reducing the salary and benefits of public employees 10% (either by pension reform or outsourcing) instead of laying off 10% of employees actually decreases unemployment.